"Toots was my neighbor for 25 years. She was a busy..."
"Although I had not had contact with Toots for a number..."
Emma LaRose, 95, of Vancouver, WA, passed away peacefully in her own home on March 15, 2018. She was born in Medicine Hat, Alberta, Canada to Otto and Julia Matheson on Oct. 18, 1922. Following high school graduation, she served in the U.S. Army. 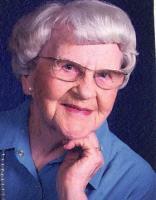 Emma married Donald LaRose and was a stay-at-home mom who enjoyed sewing, walking, boating, traveling and gardening. She was a member of Trinity Lutheran Church. Emma gave her time freely to those who needed help. She cooked for Share House for 35 years and made quilts and put together care packages for Lutheran World Relief for over 60 years. She served many other ways at her church. Emma never quit until her health forced her to. many friends who will miss her dearly. Emma is survived by her son, Donald LaRose (Pam); daughter, Debra White-Carver (Dennis); grandchildren, Yvette, Tammy, Jill, Scott; 6 great-grandchildren; and her precious fur companion of 9 years, Winchester. She was preceded in death by her husband, Donald; brothers, Ralph and Howard; and sister, Ruby. A memorial service will be held at Trinity Lutheran Church on Sat., April 28, 2018 at 11:30 a.m. Donations may be made to SW WA Humane Society.